The Big Brother Insider: Counting Down the Hours!! With Less then 60 hours till the season premiere of Big Brother 14, I have posted a few reminders for you below! 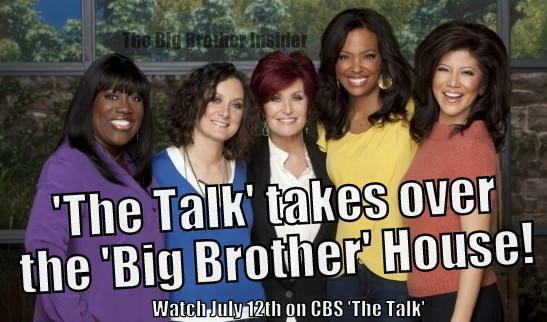 The CBS Daytime talk show The Talk will be entering the Big Brother house, the footage of inside the condensed game they played will be shown on the July 12th episode (Thursday). Check your local listings for times the show will air. The deadline for the Live feeds is fastly approaching. July 11th (TOMORROW) at 10pm the Early bird special of 29.99 for 3 months will end and it will go back to the regular price of 39.99 for 3 months. Since this is my 1st season getting the live feeds, Im not having people buy the feeds through me. But you can CLICK HERE to get them. The feeds will not go LIVE until after the Premiere ends on the west coast. This season, we will be posting, tweeting, blogging SPOILERS. Do not to read this blog if you dont want spoilers this season. Remember, You can Find us online. 'Like Us' on Facebook & Follow us on Twitter! We recently just passed 200 likes on facebook and on twitter over 2000 tweets and over 1,500 followers. Thank you for your continued support. I would just like to remind everyone this whole Mentor Twist Rumor is still just a rumor! Nothing is official until Chenbot (Julie) says so. I can see it happening but also I can see it being completely untrue. However it seems very likely that the returning Houseguest will be Janelle (BB6/BB7), Dan (BB10), Mike "Boogie" (BB2/BB7), Brittney (BB12). We shall see when Big Brother premieres July 12th 9/8c! Don't Forget to Find us on Facebook & Twitter!